After graduating from University of the West of England, Bristol with a BA in Business Management and Psychology in 2012, Ally began working for SafeLane Global as a Project Executive. Impressed with her adaption to the role and keen to encourage her career within the industry, CEO Adam Ainsworth asked her to undertake an EOD Level 3 training course. This technical awareness, combined with field knowledge, enabled her to be promoted to Operations Manager. After over a year in this new role, Ally’s operational portfolio includes Western Sahara, Syria, Sudan, Lebanon and the Central African Republic. What have you most enjoyed about your role as an Operations Manager at SafeLane Global? The most enjoyable element of the Ops Manager role is working with our international team. I feel very privileged to work alongside our dedicated and professional staff in both the field and offices around the world. Anyone who knows me will also know I love any opportunity to get out in the field and travel to task areas where our teams are operating. Sometimes it can take a couple of days on multiple flights to reach our project locations, and even then the flexibility and attention to detail when planning my deployments need to factor in second and third case scenarios – but it is always worth it. Our operational personnel do a fantastic job in locations that can be very hostile, remote and challenging. It is of huge benefit to experience first-hand what they are up against within their area of operations and ensure continuous improvement within the operational parameters of the client, task and host country. 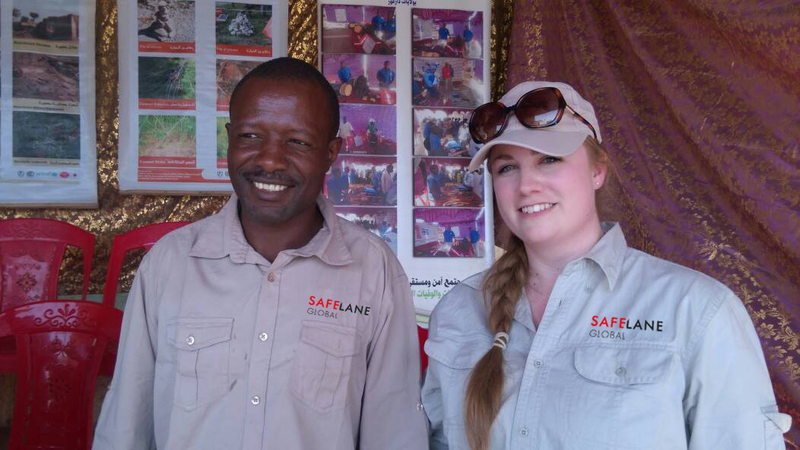 During my time with SafeLane Global I have travelled to some of the most conflict-ridden countries in the world such as Syria, Sudan, Mali, Iraq and Central African Republic and I always find it rewarding to see how our work contributes to the safety of the local population. SafeLane Global ‘boots on the ground’ make a real difference to communities. What kind of challenges do you encounter when you travel to visit projects? Security in the environments where we operate can be a daily challenge, but respecting cultural guidelines, maintaining awareness and not falling into routine mitigates unwanted attention and minimises risks. SafeLane Global operates in many insecure regions and we have to consider a range of potential threats. Another challenge is that some cultures have more regard for men in prominent positions within business. This can prove interesting during meetings when I raise an opinion or provide guidance on clearance methodology and operational direction, but most teams don’t acknowledge a difference. Women can also stand out in operational field teams, where the majority of personnel tend to be men. I wouldn’t say this has caused me any personal challenges; it doesn’t phase me and I don’t feel like I am treated differently when living in our camps, but it would be nice to see a more even balance between men and women. This is an issue across the mine action community and, like many other charities, NGOs and commercial companies, SafeLane Global has been working hard to recruit, introduce and train more female field staff within mine action. We have made good progress but there is always more work to be done. What kind of gender-related issues have you encountered in mine action? Just as landmines and unexploded ordnance (UXO) can pose differing challenges to men, women, boys and girls, clearance operations can also have gender specific implications. For example, in some communities there are cultural taboos about men speaking to women they are not acquainted with. So, without key female staff we would be unable to gather local knowledge for non-technical surveys in a way that is both inclusive and culturally respectful. As weapons and warfare change there is also a difference in the way unexploded ordnance affects communities. For example, the majority of landmine victims are men because they are generally more likely to be soldiers or to work in the fields as farm workers. But with the rise of improvised explosive devices (IEDs) we have seen a higher proportion of women and children injured or killed. As the nature of conflict changes we need to respond to the changing identity of potential victims, such as ensuring we have an adequate number of female medical responders. But it isn’t just about trying to reach women for their own safety, it is often said that when you teach a woman you teach a family. Often having a central role in educating children, women in local communities can present mine action organisations like SafeLane Global with a great opportunity to educate the general public about the dangers of UXO. This means we have not only safeguarded the women themselves, but we have also helped to safeguard the next generation. What advice would you give women considering a career in mine action? Go for it, don’t be afraid to get involved! You get opportunities to challenge yourself in remote locations, work with different cultures, clear dangerous areas making them free of mines and explosive remnants of war (ERW), enabling local communities to explore and redevelop land, making the world a safer place. Mine action is a diverse, challenging and fulfilling career – no two days are the same. My advice would be to find a team and company like SafeLane Global that both value and promote ownership, opportunity and diversity in the work place and begin your journey into the mine action sphere. Check the SafeLane careers pages for opportunities, we are always looking for talented individuals to join our team.